For nearly 200 years, the West Coast has lured the young and adventurous with many promises and beautiful locales. But the West Coast is not paradise. Danger lurks behind every corner, a threat behind every wheel. How can a visitor know where the beauty ends and the beast begins? Consult . . . The AADA Road Atlas and Survival Guide, Volume Two: The West Coast. 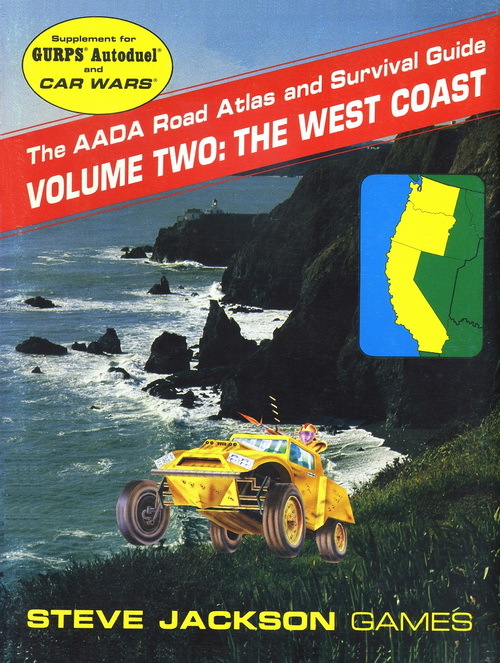 The West Coast is the second volume (following the popular East Coast edition) of an ambitious project by your American Autoduel Association. The AADA Road Atlas and Survival Guide will tell you everything you need to know about each region, including the roads, political situations, police procedures, tourist attractions, and even the best restaurants and truck stops. Los Angeles's Civic Senate: Is it democracy at its finest, or anarchy at its worst? Kreegan's Edge, a land/sea bandit gang terrorizing Northwest shipping. The Orange County Agricultural Enclave. Aqua Sueve, the most enigmatic screen star ever. A complete description of the Scout Commando Corps, including their organization, activities, ranks, and even merit badges! Campaign guidelines for GURPS Autoduel GMs, with advice for setting an adventure in any part of the West Coast. Mini-adventures for GURPS or Car Wars, each set in a different part of the region. "Flash of Steel," a complete adventure for GURPS Autoduel. Harry Coppola's latest budget-busting epic could be the biggest money-maker in Hollywood history – or the biggest flop. When the only copy of the final edit is stolen by one of the nastiest cycle gangs in Los Angeles, are you tough enough to get it back?